In quantum physics the (orbital- or spin-) angular momentum components , , and are represented by noncommutating Hermitian operators. Therefore, no quantum state exists with the property that two of the uncertainties , , vanish simultaneously. This Demonstration shows the product , which depends on the angular quantum number , either an integer or a half-integer, and also depends on the magnetic quantum number , (there are values for ). Here it is provided that the actual quantum mechanical state is a simultaneous eigenket (eigenstate) of the operator and of the component ; the eigenvalues of are , where is reduced Planck's constant . 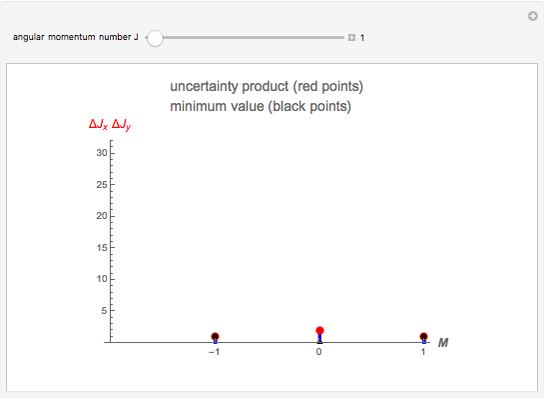 The uncertainty product is an increasing function of the quantum number . 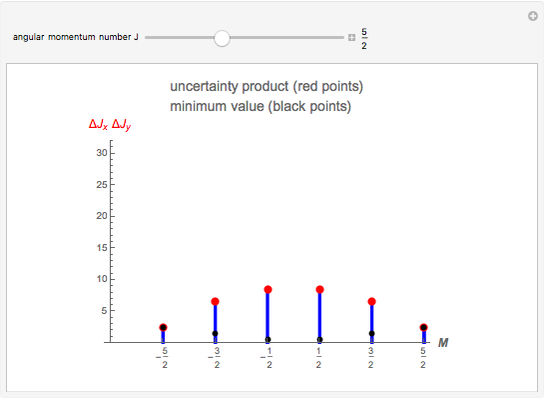 Furthermore, it can be seen that (for fixed ) such states with are minimum-uncertainty product states; otherwise states with or have maximum uncertainty products. The general uncertainty relation for any noncommutating operators , reads , where is the expectation value of the commutator . In the special case of angular momentum operators , we obtain . 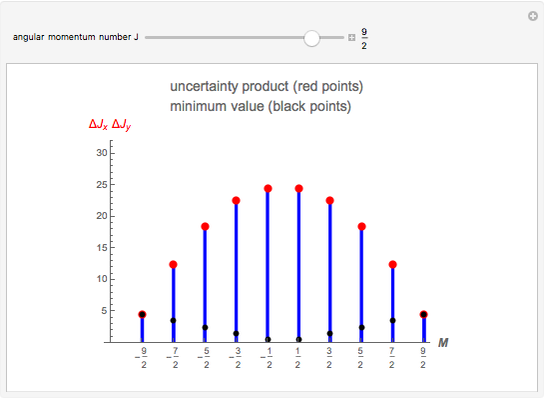 In the common basis of , eigenstates, the desired uncertainty product can be calculated exactly: and plotted in the diagram. L. D. Landau and E. M. Lifschitz, Quantum Mechanics, Reading MA: Addison–Wesley Publishing Company, 1958. J. J. Sakurai, Modern Quantum Mechanics, Reading MA: Addison–Wesley Publishing Company, 1995. P. Reineker, M. Schulz, and B. M. Schulz, Theoretische Physik III: Quantenmechanik 1, Berlin: Wiley–VCH, 2007. Reinhard Tiebel "Uncertainty Product for Angular Momentum Components"